Charles ‘Cow Cow’ Davenport is a unique and highly influential figure in the development of blues piano. His moniker comes from his most famous number, Cow Cow Blues. Davenport recorded this tune in several different formats: vocal with piano accompaniment, piano solo, piano roll, and with the unlikely ensemble of piano, cornet, and violin. The earliest recording was made in 1925 with vocalist Dora Carr, the piano part being nearly the same as the solo records made in 1928. His style is difficult to categorize and perhaps can be described as pre-barrelhouse or pre-boogie woogie. Like George W. Thomas, Cow Cow Davenport did not quite play in a boogie woogie style but was undoubtedly influential on its development. One of Davenport’s classic gestures is a descending figure that often starts high and can end up in the depths of the keyboard. Variants of this idea are found in Cow Cow Blues and 5th Street Blues. This idea appears to have its genesis in William King Phillips’s Florida Blues, published in 1915. Even the motivic material of Cow Cow Blues and 5th Street Blues is similar to Florida Blues in that they have a repeated neighbor motion and a downward gesture, just the order is reversed. 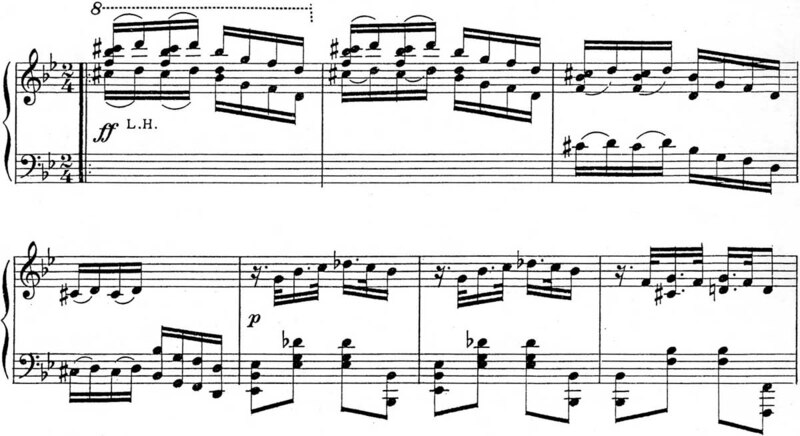 A motive from a passage in Jelly Roll Morton’s New Orleans Blues (aka New Orleans Joys) is actually identical to Cow Cow Blues and 5th Street Blues. New Orleans Blues was recorded in 1923, two years before Cow Cow Blues, but may have been composed as early as 1902 or 1905. Davenport, In turn, was widely influential on other pianists including Bob Call, ‘Cripple’ Clarence Lofton, and Albert Ammons. Davenport was one of the first to record using a “three-fingered” walking bass with the interval of a 5th between the usual octave notes. This technique can be found frequently in recordings by Call and Lofton. Lofton, among others, also used the cadential tune from Cow Cow Blues in his Streamline Train. However, this tune can be found in earlier pieces, including George W. Thomas’s 1924 piano roll of Caldonia Blues, so we can’t be certain that it originated with Davenport. Another obvious influence is on Albert Ammons. Davenport’s piano roll of 5th Street Blues, and its equivalent sound recording, State Street Jive, both feature an ascending chromatic figure that later showed up in Ammons’s Bass Goin’ Crazy. An oddity that exists in Davenport’s output is that his 1927 piano roll swings the 8th notes while his sound recordings from 1928 and other years do not. Since the recordings are otherwise comparable this suggests the question of whether the roll was tampered with. A case of such tampering exists in a later edition of Scott Joplin’s 1916 piano roll of Maple Leaf Rag, which was altered to have a swung rhythm. In Davenport’s case, however, it seems less likely, so it remains a mystery. Davenport’s playing underwent a stylistic change later in life, partly by necessity. He had suffered an illness that left his right hand damaged and barely functional. Thus, his later recordings, such as Cow Cow’s Stomp, feature a very active left hand but with the right hand only contributing relatively sparse chords and short melodies. This texture bears a remarkable resemblance to the already-established style of James ‘Stump’ Johnson in recordings like Bound to Be a Monkey (see the page about Johnson). This is possibly a reversal of Davenport’s usual influence on younger players. ‘Cow Cow’ Davenport’s earlier, and most famous, recordings can be found on Cow Cow Davenport, Volume 1. His later recordings are on Cow Cow Davenport, Volume 2. A recording of some of Davenport’s piano rolls, including Cow Cow Blues and 5th Street Blues, are on Boogie Woogie Blues.